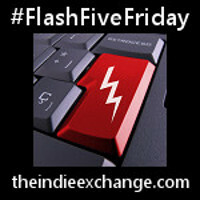 #FlashFiveFriday is a weekly flash fiction / flash blogging prompt hosted by The Indie Exchange. I used to like mythology until 6th grade. You see I read above my grade level until I moved to Georgia and was told that wasn't allowed (except for those in the gifted program apparently). When I got to middle school my literature class was divided with about half the class suddenly being allowed to read on the 7th level and the other half on the 6th grade level. As far as I could tell it was solely based on the standardized test we took every 9 weeks. If you weren't automatically put in the 7th grade half you had to make a perfect score on the test. I missed getting "promoted" by 2 points on the first nine weeks. I spent the next 9 weeks listening to my friends in the "smart" half of the class talk about Greek mythology. I did make 100% on the next test and was promoted. So not only did I not ever get a section on Greek mythology, I also associate it with a bad memory. Your turn: Do any childhood experiences shape your adult reading habits? Donna - The Greek Myths are still fun, even at our age. I hope you've overcome the sad experience you had in Grade School/Middle School. I remember reading the Greek Myths in 7th grade, but I wasn't a sharp reader back then. In my day there were standardized tests, but they weren't used to thin class sizes. Wow, that's such an unfair rule! It's crazy! Spoilsports. I've picked up the basic stories (probably from trivia games or what not). I'm listening to Percy Jackson. I did read a book a few months ago that I really loved and it had to do with Egyptian mythology. Ugh! The same thing almost happened to me. I scored above the cut off by 2-3 points and they weren't going to promote me. My father went in and argued with them. "Did she score OVER the point limit?" "Well, yes, but only by a couple of points." "But she scored OVER the point limit so put her in the class." LOL One of the things I'm most proud of my dad doing for me. It might not have been so bad if not for 2 reasons. One, I was ranked #2 in academic standing and, two, we were in the same classroom (the desk were grouped together to separate us but it was the same class period and same teacher). Although I'm not a huge myths fan I do appreciate the story-telling in them but yes, a bad experience can definitely turn you off. So can hearing too much hype about a book I think. Both Ulysses and The Satanic Verses have defeated me, despite being repeatedly told I 'must' read them both!